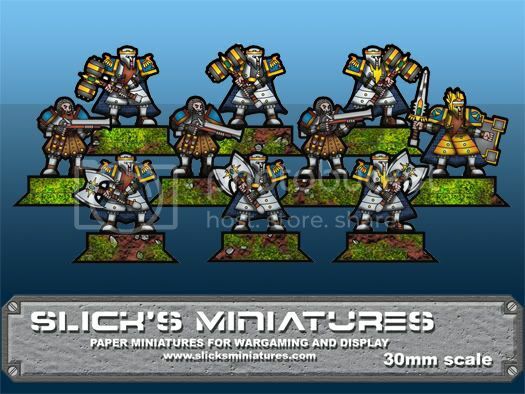 This set gives you 3 types of Heavy infantry to bolster your Dwarf army! Heavy armored dwarfs with Great Hammers and Great Axes as well as some Riflemen to supply ranged support. Leading the unit is the powerful dwarf Paladin. In this set you will receive 10 individually posed figures. Three with Great Hammers, Three with Great Axes, Three riflemen with Muskets and a Paladin Hero figure. There are two colours in the file blue and red. Also included is a blank set for you to color as you wish and the vector parts for you to create your own troops. Each set comes with front and back artwork and is rendered in 300dpi. I really like what he's been able to achieve with the vector designs.